Fifty years ago, Congress created Medicare and Medicaid and remade American health care. The number of elderly citizens lacking access to hospitals and doctors plummeted. Hospitals, physicians, and state and local governments came to depend on this federal funding. We have a tendency to forget the history of laws that extended the obligations and commitments of the federal government. But the passage of Medicare and Medicaid, which shattered the barriers that had separated the federal government and the health-care system, was no less contentious than the recent debates about the Affordable Care Act. When President Harry Truman proposed national health insurance for every American in 1945, and again in 1949, as part of his effort to move forward with domestic policies that had been left out of the New Deal, he and allied liberals came to see why F.D.R. had avoided the issue of health care back in the nineteen-thirties. The American Medical Association conducted the most expensive lobbying effort to that date in opposition to Truman’s health-care plan, which it branded as “un-American” and “socialized medicine.” Charging that the Truman Administration consisted of “followers of the Moscow party line,” the A.M.A. worked closely with the conservative coalition in Congress to kill the measure in committee. By 1950, the proposal was dead. Still, many Democrats remained convinced that the health-care system left too many Americans without access to affordable care. In 1957, Congressman Aime Forand, an ardent New Deal liberal who had quit school after seventh grade to take care of his ailing father, came up with the idea of a smaller and more targeted program as a first step toward national health insurance. 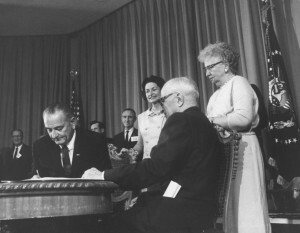 When Lyndon Johnson became President, in November, 1963, he made it clear that he was determined to pass Medicare. On Election Day, everything changed. Johnson defeated the right-wing Republican Senator Barry Goldwater in a landslide victory. Democrats obtained two hundred and ninety-five seats in the House and sixty-eight in the Senate. For the first time in decades, liberal Democrats, rather than more conservative Southerners, held the balance of power within their own party. When the eighty-ninth Congress convened, in January, 1965, the emboldened liberals drove through a series of reforms and reorganization to further strengthen their hand. With the passage of Medicare and Medicaid, decades of obstruction came to an end. But turning a legislator like Mills was not easy. Persuasion and negotiation could only go so far. It took a big election, with voters changing the balance of power on Capitol Hill, to get him moving in the right direction.